I still read aloud to my 11-year-old son at bedtime. We do it because he still loves it, so we have just never stopped, but here are a few other good reasons to do it. We have read so many good books together over the years, including all 7 Harry Potter books, the Narnia books, Dragon Rider, Hatchet and Brian’s Winter, The Hobbit, and a bunch of Gordon Korman books (his favourite right now). 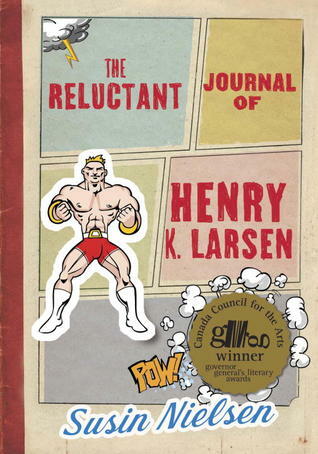 For Christmas, he received The Reluctant Journal of Henry K. Larsen, and I had heard it was good and was excited to get to it, so one night a few weeks ago we did. If I had known how intense it was going to be, I might have thought twice about it, but now that it’s over, I’m glad we read it together. There were many cringe-worthy moments that had him hiding under the covers, whimpering – like when I read about how they used a condom to keep the fruit flies from coming out of the end of the vacuum. And, when Henry talks about Karen’s cleavage, or the part when he kisses Alberta. But, when we got to the big secret, the crux of the story, we were both shocked. I looked over at him and saw the gravity of what I had just read fall over his face. And, although he never cried, many times throughout the book, he had to put up with me pausing and collecting myself before carrying on. But, wow, if you want to read a book about bullying and the ripple effects it can have, then this is the book. It is so well done. Susin Nielsen takes a loaded, shocking, depressing subject and weaves it into a sensitive, engaging story, peppered with humour. Yes, it is still shocking, and at times uncomfortable, but it is also sweet, funny, and appropriately written for teens. It sends a message to all readers that this unimaginable horror could happen to anyone, so be kind, and don’t judge. As we were reading it, I promised my son it would be okay in the end, because it’s a children’s book, and all books for children turn out okay in the end, right? When it was over, we breathed a sigh of relief, and moved on to some more Gordon Korman. After reading about Henry K. Larsen, I am determined to check out the rest of Susin Nielsen’s books. What have been some of the toughest books you’ve read to your kids? I didn’t realize our boys are about the same age! (Mine will be turning 11 next week.) I still read to him too and he also loves Gordon Korman. But wow about this one…it sounds very intense in a good way but thanks for the heads up. I will wait a little bit before introducing this one! Your son was okay though? Mine will be turning 12 this month, so they are almost exactly a year apart. I was thinking your son was quite a bit younger, but he’s not at all! If I were you, I’d wait at least another year for this book, then go from there. And, I think it would have been helpful (at least for me) if I had read it myself first. Then I would have been more prepared for the subject matter. It kind of took us by surprise. I love that you still have this time together! Sounds like you guys get to read some pretty great books too. And like it was a good thing that you read this one together so that you could talk about what you were reading! I always think that it’s a big mistake people make to not read what their kids are reading – not you in this case, obv. You were reading together. But there are lots of parents that probably had no idea what The Hunger Games, for example, were like and those I think need to be discussed. I have had so much fun reading books with my kids. I still can’t believe we read the whole Harry Potter series by reading just a chapter a night. It took a long time! Sounds like you’ve accomplished the big thing – turning your kids into readers! I also love that you read to your son at this age. My sons are a lot younger, but my biggest hope is that we’ll still be reading together when they’re older and discovering lots of good books together. Gordon Korman is so much fun. Something for you to look forward to with your own little guy! The teachers who read out loud were the best. When I was little, I wanted to be a teacher just so I could read books to my class. Glad to hear how much fun you two had reading this book. Sounds like a great read! This is a good book for girls, too, by the way. Just not until they are probably around 12+, depending on your child. My 13-year-old daughter read it on her own after we were finished, and she liked it, too. As you know, I absolutely LOVED this book. Props to you for being able to read it aloud without crying; I was definitely a sobbing mess at the end. You’re so right that Nielsen writes meaningfully but also appropriately for the age group she’s targeting. I am a huge fan. Also – I LOVED Gordon Korman as a kid, so I’m glad to hear he’s still just as popular. One of my teachers read us I Want to Go Home at school and it was the best. Gordon Korman seems to still be coming up with new ideas – the books are still coming! As a retired educator continue to read to your son. There is so much great YA fiction and non-fiction out there. It will give your child’s reading level a boast, increase comprehension and vocabulary. And of course it is wonderful for bonding. Read to him until he looses interest. You will look back and cherish those loving hours! Thanks, Brian! I completely agree. He was slow learning how to read and still struggles at a certain level, so I am so happy that he still wants me to read to him. I do believe it has helped him with his own reading and comprehension. In fact, his teachers always comment on how well he comprehends things even when they don’t think he’s even been paying attention. Also, just think of the books he would have missed out on if we hadn’t read them together! You just can’t lose with Korman – he’s been writing for so long he just never misses the mark with kids. I just finished Gifted and really loved it. I LOVE Susan Nielsen, I’m so glad you discovered her! I agree that The Reluctant Journal was great, though I still think Word Nerd is my favourite of hers. I wasn’t as crazy about Dear George Clooney, Please Marry My Mom, but it was good. Can’t wait until her newest comes out in May! Reading plays is a good idea, especially if you have a little actor in the house (which I do). Thanks for the idea! I had my eye on Word Nerd, but hadn’t heard much about it – so, good to know you love it. Really, you can’t beat Korman for kids. He has written so many different types of books for a wide range of ages. Too bad our local bookstore is only carrying two of his books right now (I was there checking just yesterday). How can they only have two?? Two? Two? That’s just ridiculous.